Greece. It’s the birthplace of western civilization, democracy, and science. This country lays claim to some of the most brilliant minds in philosophy, mathematics, astronomy, and politics that the world has ever seen. All of these wonderful thinkers developed the most advanced ideas of their day, some of which are as true today as they were 2,600 years ago when they first began pondering the big questions. So who or what is this descendent that can lay claim to being Greek through and through, but has never seen the white cliffs of Mykonos or tasted a delicious spanakopita while sipping an aromatic Samos wine? Who dares claim to be of the same ilk as Herodotus, Hipparchus, or the formidable Socrates? Luckily, few are pompous enough to compare themselves to some of the greatest minds of ancient Greece (well, except for maybe Donald Trump, who seems to think very highly of himself). Instead, it is I who is nominating someone for this honor. And when I say someone, I mean something, or more precisely some watch because watches are like people to me. We even have dinner parties, just they and I. For some reason they are always running late though…I can’t understand that one. Random language-nerd side-note: The word “opa” actually means “whoops” or “oops” in Greek, which is why it has come to be associated with the rare act of smashing plates. They weren’t actually happy to be dropping china, but foreigners missed the context clues. In all seriousness, the latest object of my watch lust is the Rotonde de Cartier Astrocalendaire Perpetual Calendar, which debuts today at the SIHH. It is a magnificent take on a complicated – yet sometimes stale – complication, and goes in a direction that I would not have expected but enjoy very much. The Astrocalendaire departs from the typical displays and traditional mechanisms that make up the majority of perpetual calendars. Gone are the springs and levers and central program wheel, which rotates once every four years. In its place comes a complicated, yet relatively straightforward, system of gears controlling everything: 67 of them comprise the perpetual calendar function, while 19 components make up what Cartier dubs the “brain” of the piece. Pinky and the Brain have nothing on this central thinking machine. It sits on multiple levels and eliminates many of the negative aspects of standard perpetual calendars, one of them being the force required to make the indicators jump and its adverse effect on the amplitude/timing of the piece. In a typical system comprising star wheels, levers and click springs, the function needs to be activated at a certain time so that it has had the opportunity to build up enough power to change the date, day, and month. This causes a “backward” force throughout the gear train that reduces the amplitude of the balance and speeds up the timing of the watch, as well as introducing larger positional errors. Utilizing only gears and a cam . . . The Astrocalendaire doesn’t have this problem. Utilizing only gears and a cam, which I’ll talk about next, it slowly changes the indications over a length of time from 35 minutes to 4 hours, depending on the change needed. This keeps the torque relatively constant and linear throughout the gear train and reduces effects on amplitude by 80 percent over the longest change. An astute WIS will probably be wondering how the jump for day can be made with a “simple” gear-based system. I have to admit I wondered the EXACT same thing as soon as I read about it. But dangit if Cartier didn’t have a trick up its sleeve, one that has resulted in a patent application. The innovation: retractable gear teeth operated via a cam. No foolin’, you read that right. Cartier has developed a system where the 31-tooth gear for the day indicator has three retractable teeth. These are extended (by cam) so that the jump at the end of the month can vary. When one of the three is extended, the indicator will jump ahead two days instead of one; three days when two teeth are extended; and 4 days (every four years at the end of February) when all three are extended. That way the entire system can be driven via gears; a bunch of star wheels and jumper springs are left in a lonely box in the corner of a workshop in Geneva. Sad for them, but awesome for us! Because of these changes and innovations, Cartier has been able to add other functions that many perpetual calendars don’t and can’t have. The date can be adjusted at any time – even during a date change – without harming the mechanism. It can be adjusted forward and backward at any time, all via the crown, and only takes three turns of the crown to advance by one whole month. The day of week is not included in this mechanism; it is always linear, so it is tied to the hour wheel and can be adjusted using a pusher on the side of the case. But that’s only one pusher for an entire perpetual calendar; I’ve seen pieces with five pushers for all of the indicator functions. So not too shabby on that front. The system I have just described is the first bit of truly Greek DNA of this watch: it takes a page right out of the Antikythera mechanism handbook, which, according to scientific consensus, used a strictly gear-based system for complex astrological calculations. The Astrocalendaire utilizes the gear as much and as well as it can – much to my delight as the humble gear is what sparked my own passion those many years ago. So, as complicated as this timepiece is, it uses an ancient simplicity that glows throughout the piece. 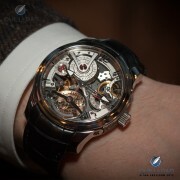 I won’t lie, it’s already a 2014 favorite for me, and the SIHH hasn’t even officially opened its doors as I write this. The second bit of Greek DNA in the Astrocalendaire stares at you from the moment you see it, and that is the innovative and stunning configuration for the actual perpetual calendar indications. Placed in a circle surrounding the flying tourbillon, it grows from the center in classic Greek fashion. Cartier has labeled it an “amphitheatre” display, a description that hits square on the nose. This piece cleanly and clearly alludes to ancient Greek ideas, architecture and discoveries, without which we would be left 2,000 years behind – and without this fantastic piece. I personally cannot wait to see more of it and perhaps get an inside view of the movement and retractable teeth mechanism, since this really is what sets this piece apart. Hmm, what would you do-OOO-ooh, for my break-down now?! While I go get a Klondike bar, you have a look at how the Rotonde de Cartier Astrocalendaire Perpetual Calendar fared in the breakdown. • Wowza Factor * 8.4 The circular perpetual calendar encompassing that flying tourbillon made me choke just a bit on my apple during lunch when I first laid eyes on this tasty piece. • Late Night Lust Appeal * 78 gn » 764.919 m/s2 This is almost as much as the hardest hit recorded in professional football, and more than enough to keep this watchnerd in his seat staring at those Greek rings. • M.G.R. * 67.9 A very geek-worthy movement, the Astrocalendaire puts a fresh take on the perpetual calendar with its decidedly Mediterranean influence. • Added-Functionitis * Severe A full perpetual calendar is one third of a grande complication, so the added function requires prescription-strength Gotta-HAVE-That cream for some serious horological edema. • Ouch Outline * 10.4 – Shampoo in the Eyes followed by Razor Burn Basically all the worst parts of getting ready for a night out. Still, I would take that any day to secure an Astrocalendaire on my wrist. • Mermaid Moment * Four years, or the time it takes you to read all of Socratic Dialogues (Whichever comes first) Perpetual calendars shine every four years when they make the biggest leap of their lives and from what I hear, it is truly an amazing moment that might require a minister and 150 guests dressed in white. • Awesome Total * 541 Take the number of parts in the perpetual calendar (67); multiply that by the number of years to make one complete cycle (4); and double the result due to the addition of a flying tourbillon. Oh, and add 5 cool points because, well, you know. For more information on Cartier’s timepieces, please visit www.cartier.com.